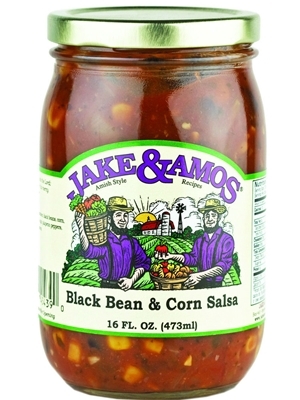 Try Jake and Amos Black Bean and Corn Salsa to add a southwest flare to your next meal. This chunky salsa is full of vegetables that are great for dipping chips or topping tacos and other Mexican dishes. Ingredients: Tomatoes, Corn, Black Beans, Onions, Tomato Paste, Water, Sugar, Cider Vinegar, Citric Acid, Salt, Jalapeno Peppers, Cilantro*, Garlic*, Seasonings (*dry).